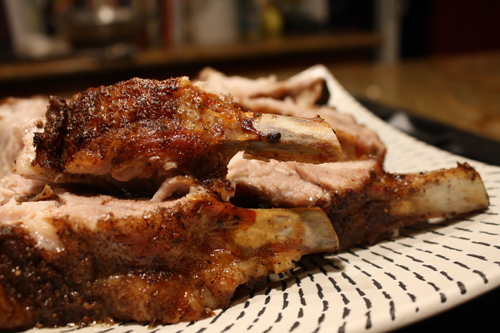 Earlier in the week, I promised you a really good pork recipe. Without further ado, and with sincere apologies to Kid n' Play, I present you with my video on how to put the partay into rack of pork. Actually, I take it back. A little bit of ado is in order. October is National Pork Month, and TheMotherhood, the National Pork Board and Costco entrusted me to enlighten you with an original recipe that turns a plain old rack of pork into something that will get the party started. Quickly. My philosophy with parties is that you can only have fun when you use your fingers. So I took my rack of pork and combined it with some really tasty components to make the ultimate party finger food: sliders. Rub all over meat. Stick in oven at 350 degrees for 20 min per pound. Combine all the vegetable ingredients into a mixing bowl. Pour everything else (except for the sesame seeds) into a tupperware and shake. 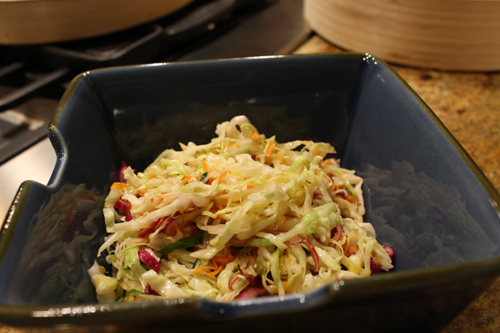 Pour the dressing over the slaw and toss to combine. Add sesame seeds. Dissolve the sugar and yeast in the warm water. Set aside for 5-10 min. Add flour into a standing mixer or food processor with a dough blade. Turn the processor on and drizzle the yeast mixture into the flour slowly. It's not going to look like enough water, but trust me, it will become a ball of dough before too long. Once it becomes a ball, remove it. Rub the bacon fat on the bottom of a mixing bowl, and then put the dough into the bowl. Cover the dough with a kitchen towel and place somewhere warm-ish for about 90 min. After 90 min, take the dough out of the bowl pound it out into a circle. Add the baking powder and knead for about 3 min. Split the dough into two halves and roll each into a rectangle. Roll the rectangle like a cigar. Cut the cigar into about 6-8 pieces. 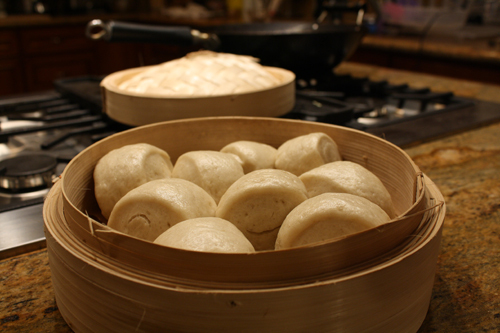 Place each piece onto a square of parchement paper, then into a steamer (preferably an old school bamboo steamer). 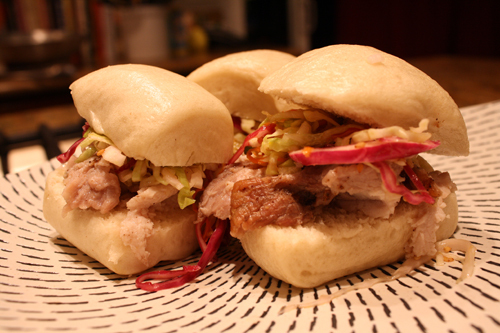 Once all three components have been made, just cut the bun in half, add pork, add slaw and serve. Celebratory dancing optional. OH, I almost forgot! I'm giving away a pork gift pack that includes good pork-related goodies and a $25 Costco gift card. Just tell me how you like to cook your pork and you'll be automatically entered into my drawing. I'm all about low hurdles.